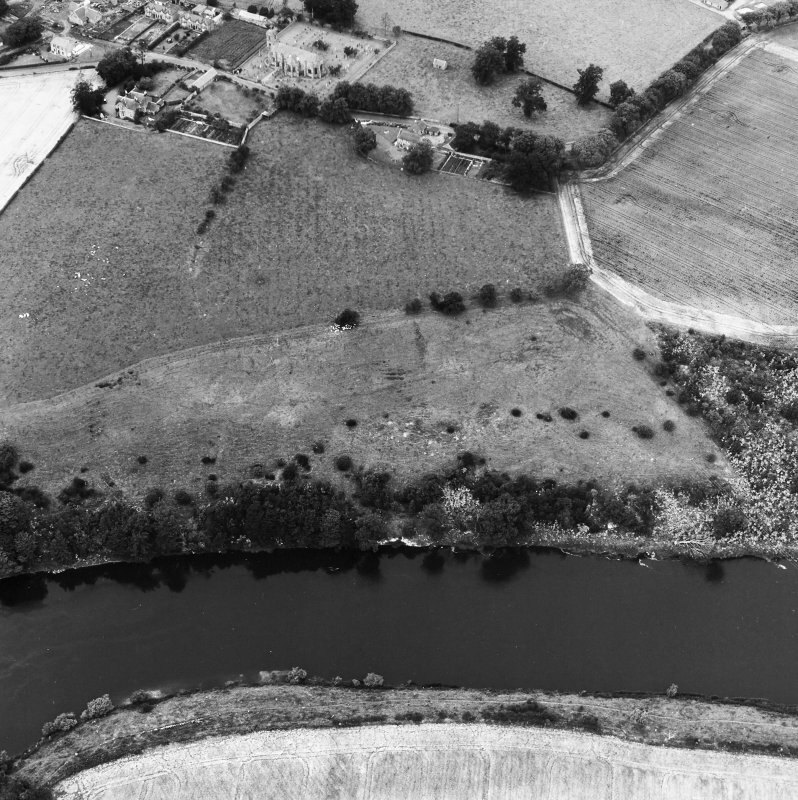 Oblique aerial view from SE. 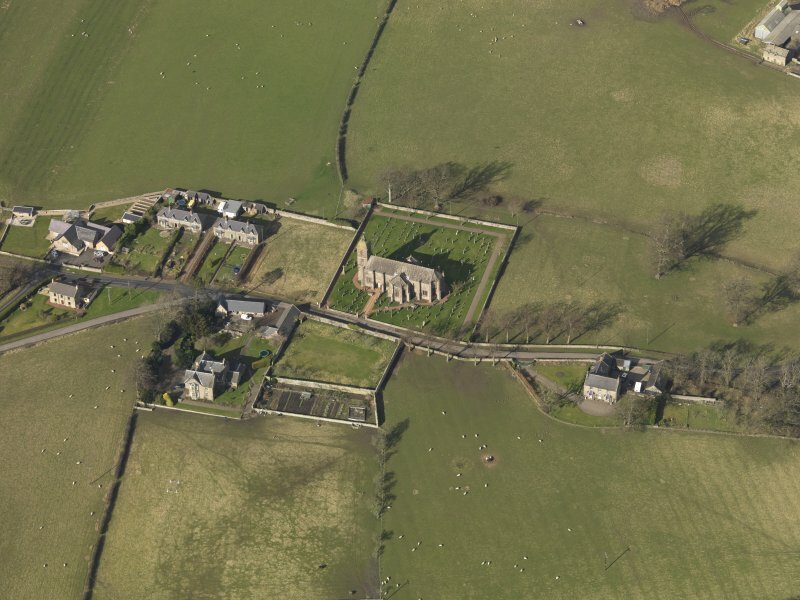 Oblique aerial view centred on church from SE. 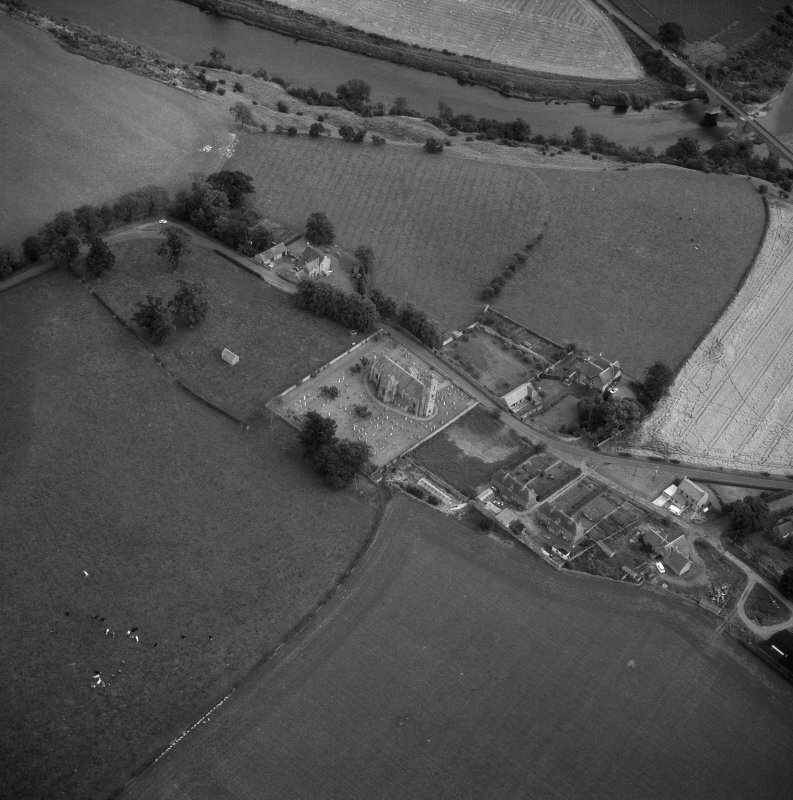 Oblique aerial view from E.
Oblique aerial view centred on church from NW. Oblique aerial view centred on the village with the church adjacent, taken from the NE. 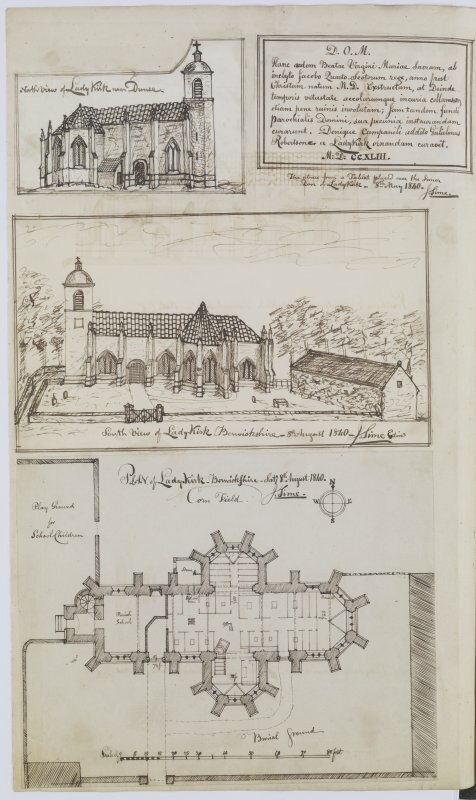 A drawing by William Begg of St Mary's Church, Ladykirk, from the North. 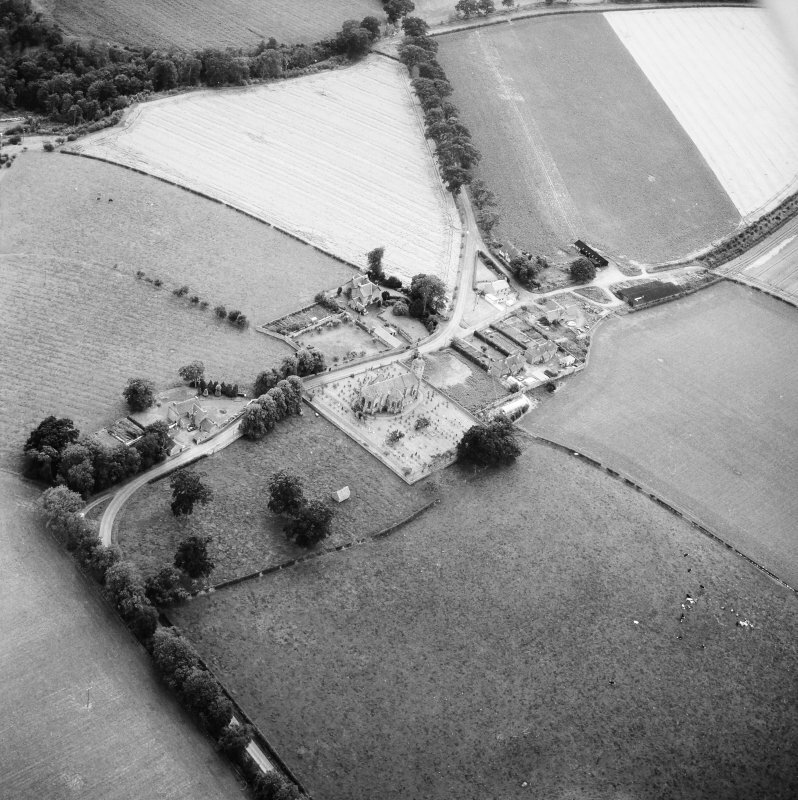 Scanned image of [negative number to be supplied]. 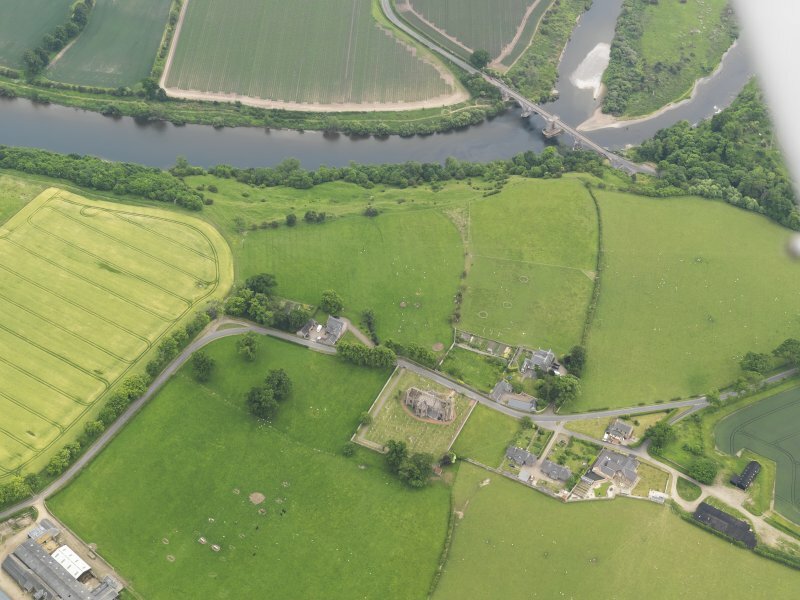 Oblique aerial view centred on church from N.
Oblique aerial view centred on church from S.
General view showing W gable and S elevation from W.
General oblique aerial view of Ladykirk Parish Church and Ladykirk and Norham Bridge, taken from the NNW. 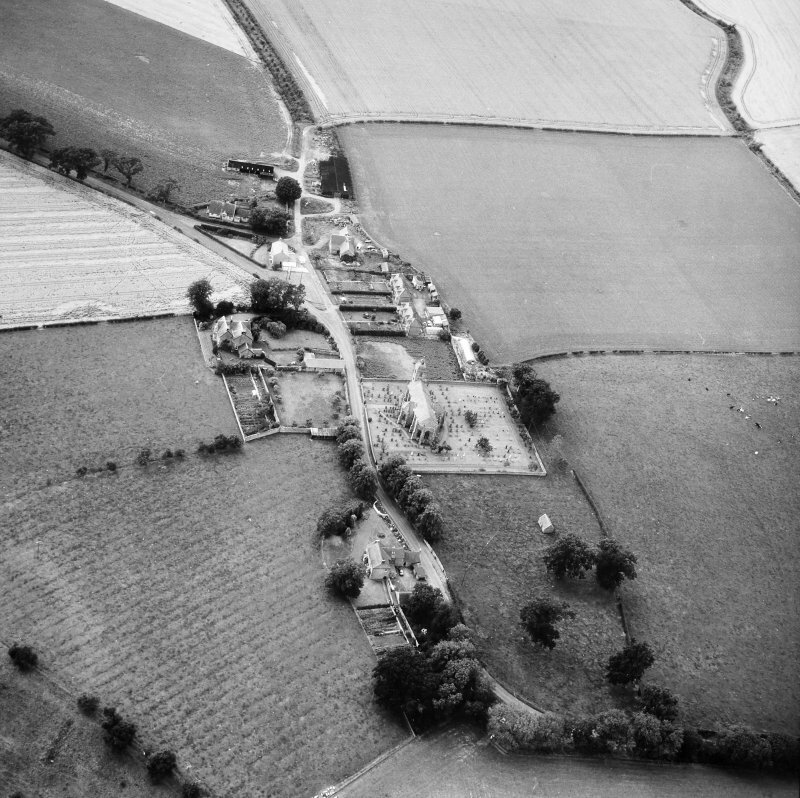 Historic photograph showing view from SE of Ladykirk Parish Church. 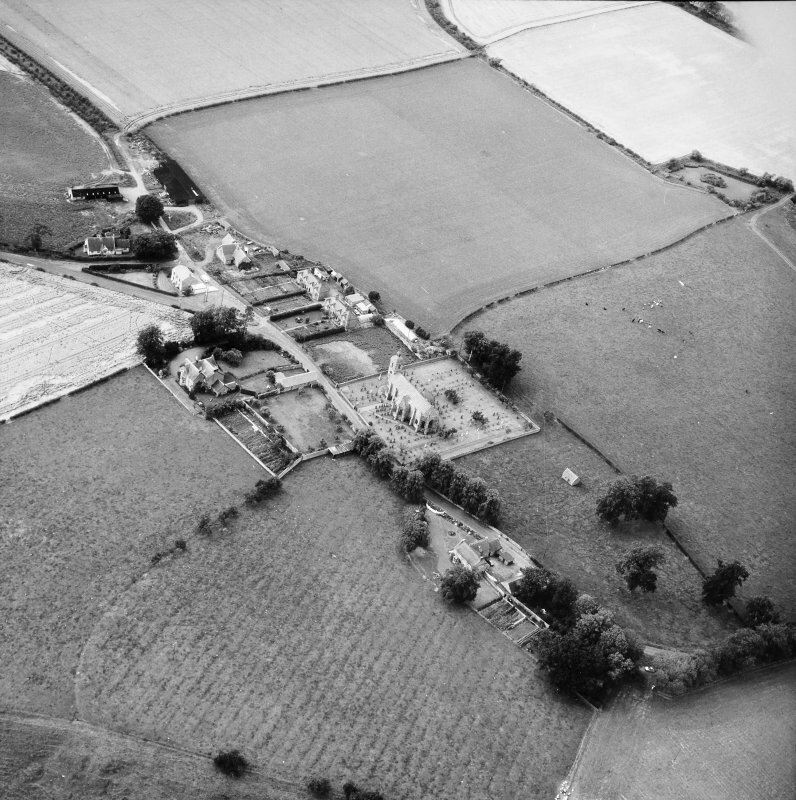 Oblique aerial view centred on the village with the church adjacent, taken from the WSW. 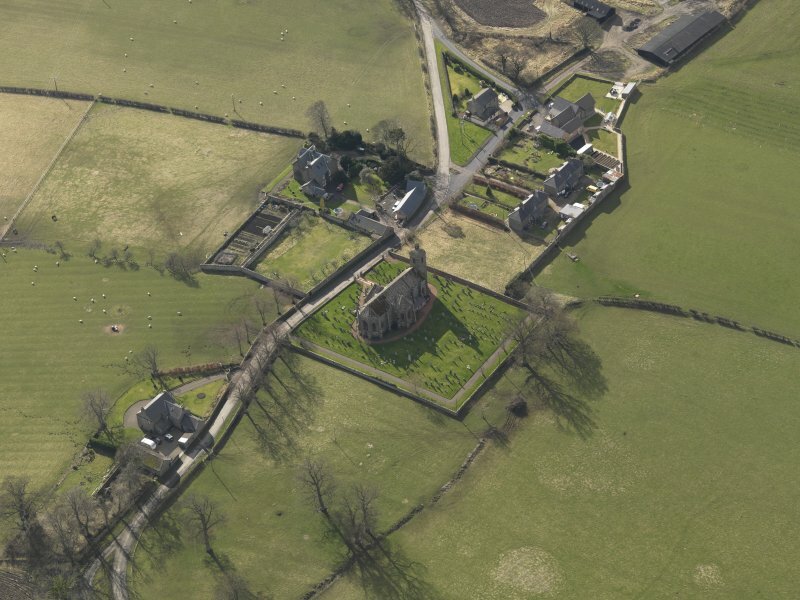 Oblique aerial view centred on church from ENE. 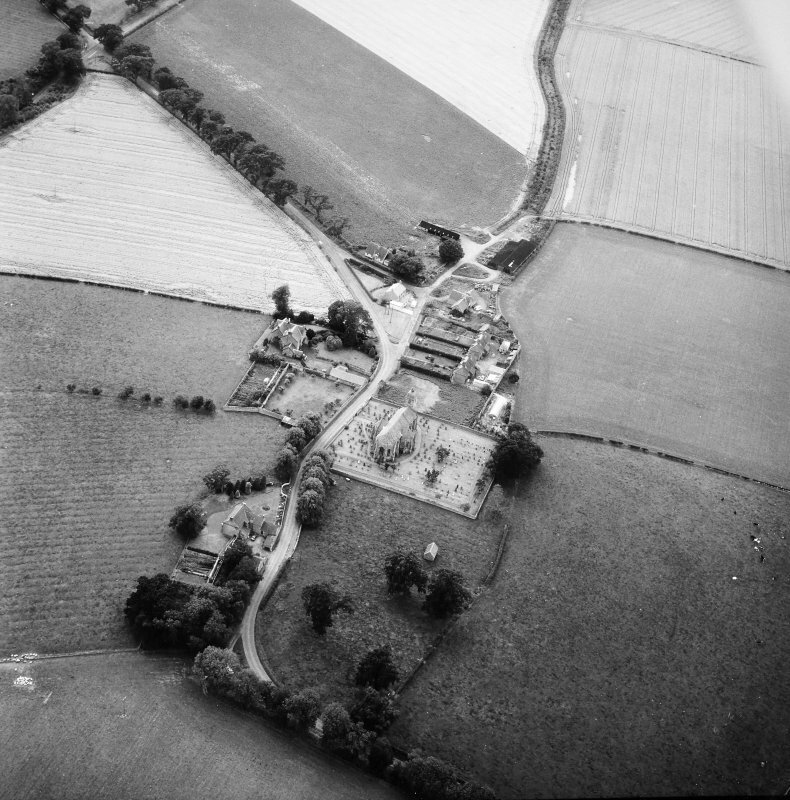 Oblique aerial view centred on the village with the church adjacent, taken from the SE. 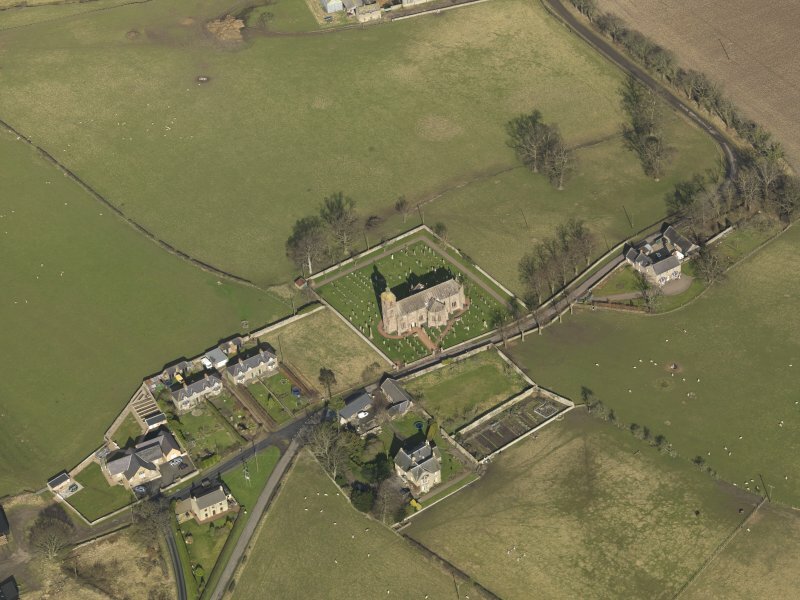 Oblique aerial view centred on the village with the church adjacent, taken from the SSE. 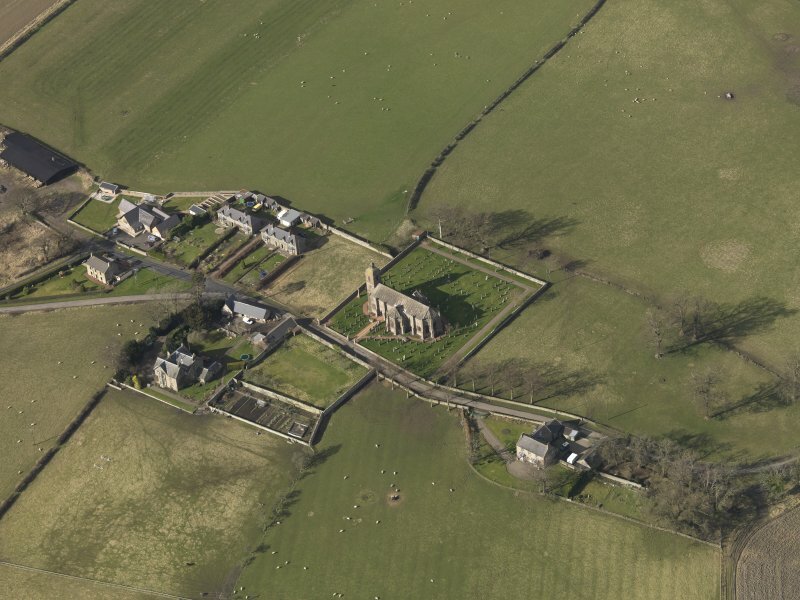 Oblique aerial view centred on the village with the church adjacent, taken from the WNW. 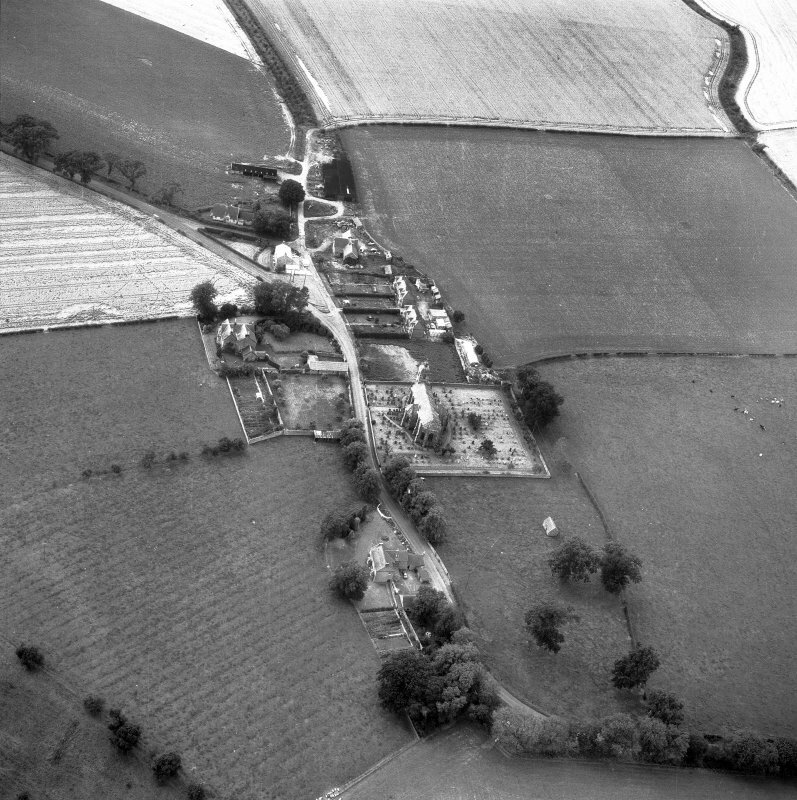 Oblique aerial view centred on the village with the church adjacent, taken from the SSW. 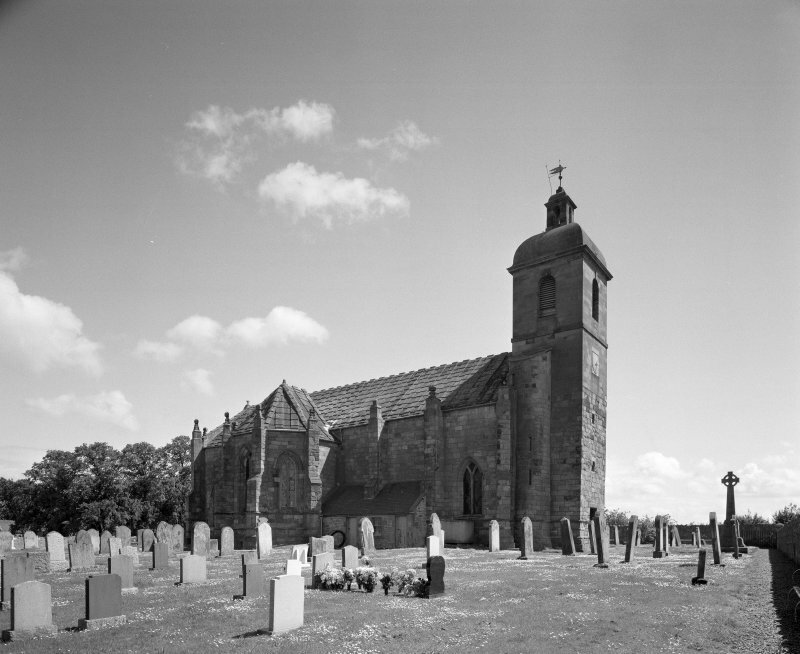 Photograph of Ladykirk Parish church. 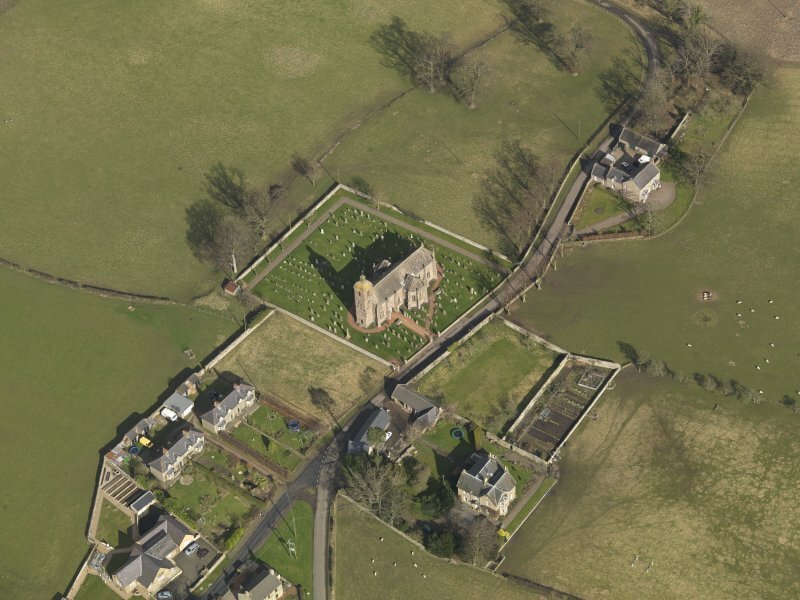 Oblique aerial view centred on church from NE. 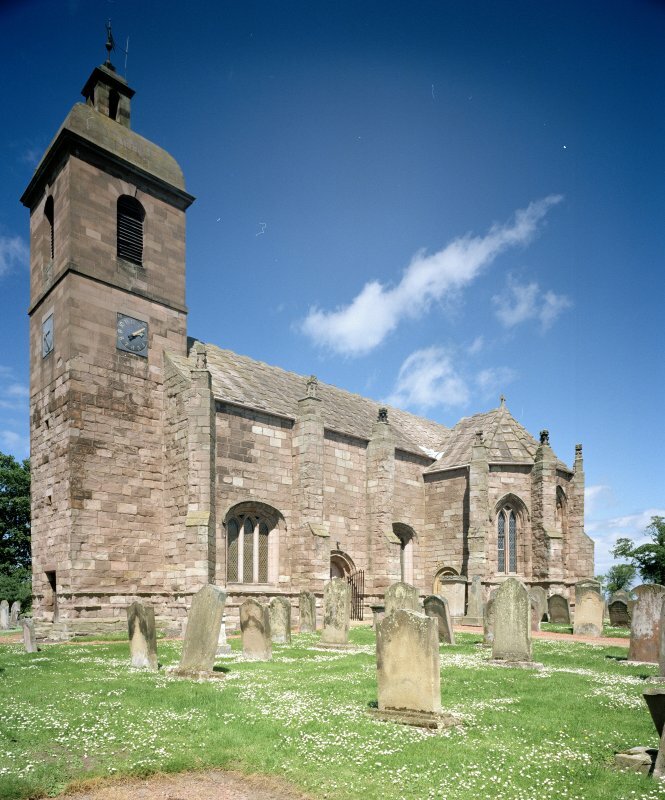 Ladykirk Parish Church dates from the late fifteenth century, and overlooks the banks of the River Tweed. 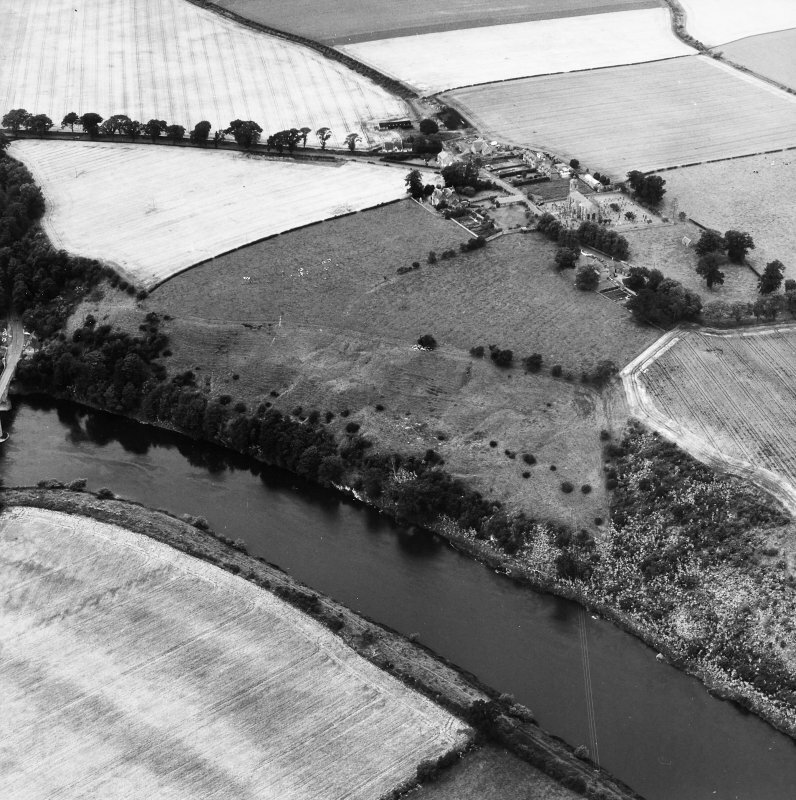 It stands directly opposite Norham Castle, an English stronghold associated with the Bishop of Durham. 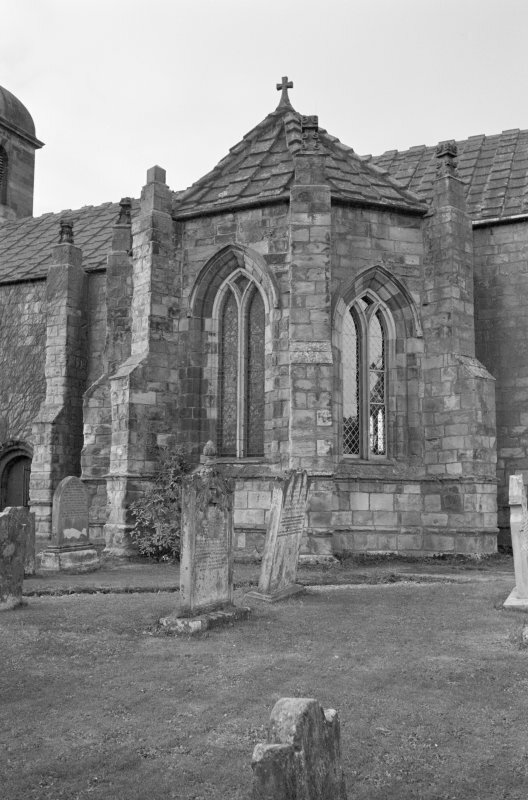 The church appears to occupy the site of an earlier church, as the fifteenth-century building overlies earlier burials. 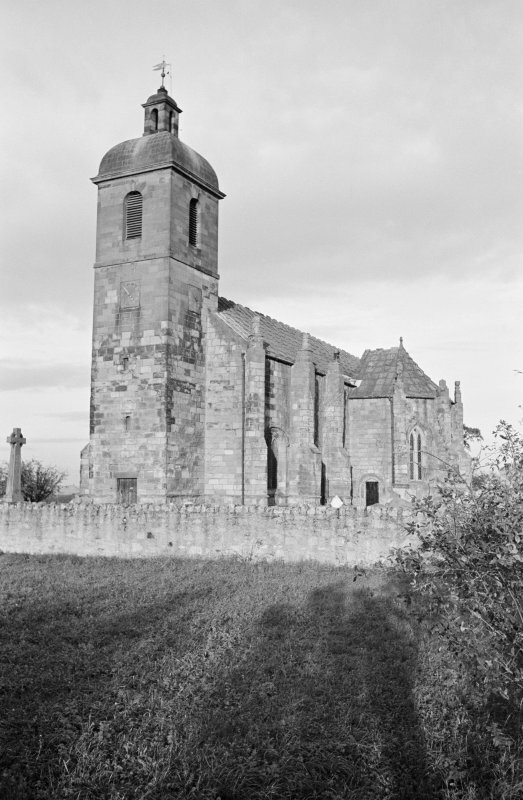 The church represents a remarkably complete example of the final development of Gothic architecture in Scotland. 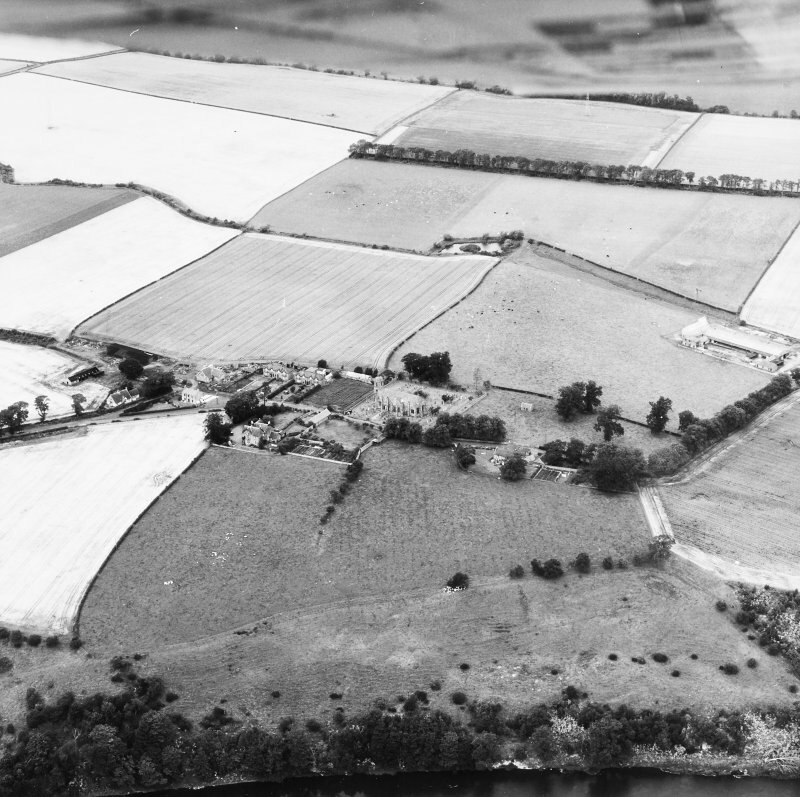 It is cruciform on plan, with the east end and the north and south aisles all following a semi-circular, apsidal plan. 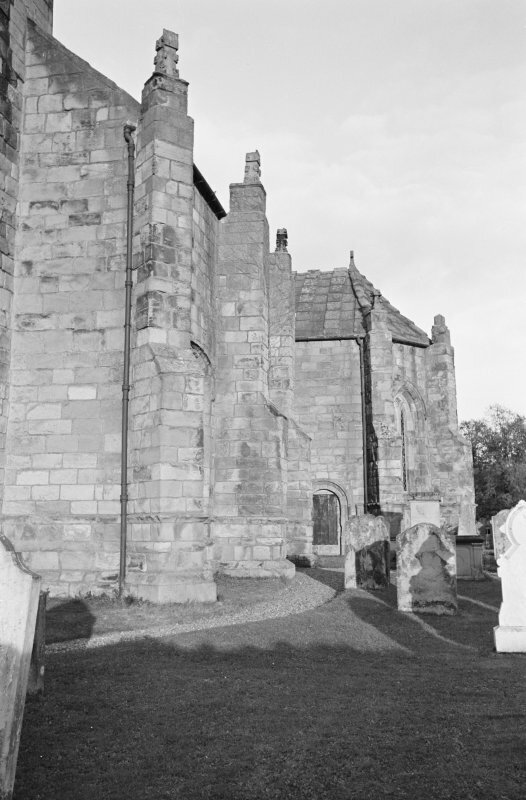 Several features are evident which are typical of this late stage of Gothic architecture in Scotland: the row of buttresses which line the exterior walls are surmounted by short stone pinnacles, and the building is entered by semi-circular arched doors. The roof consists of stone flags. 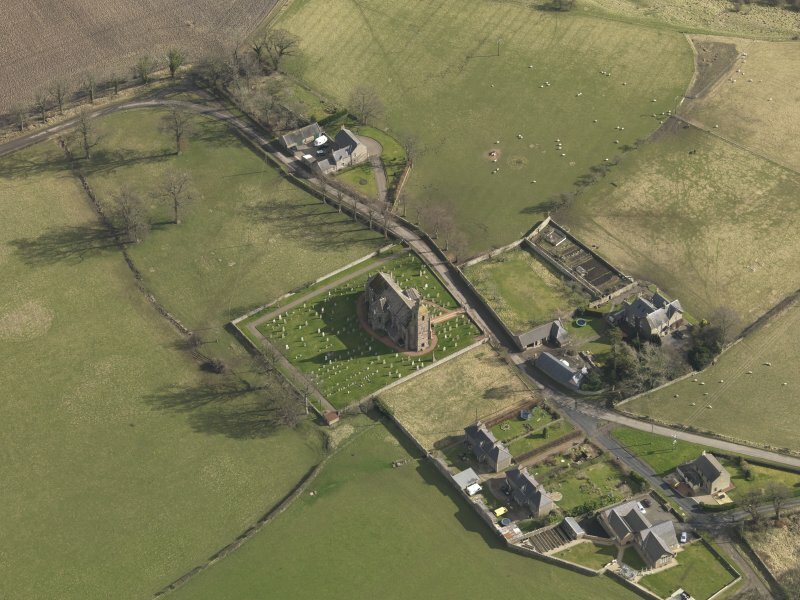 There is a tower at the west end, flanked by a circular stair-tower. 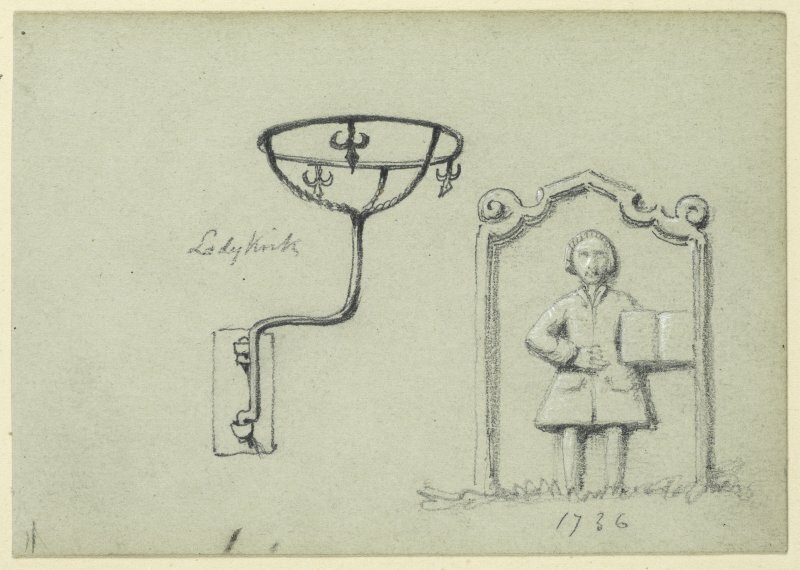 This was apparently unfinished and not completed until the mid-eighteenth century. 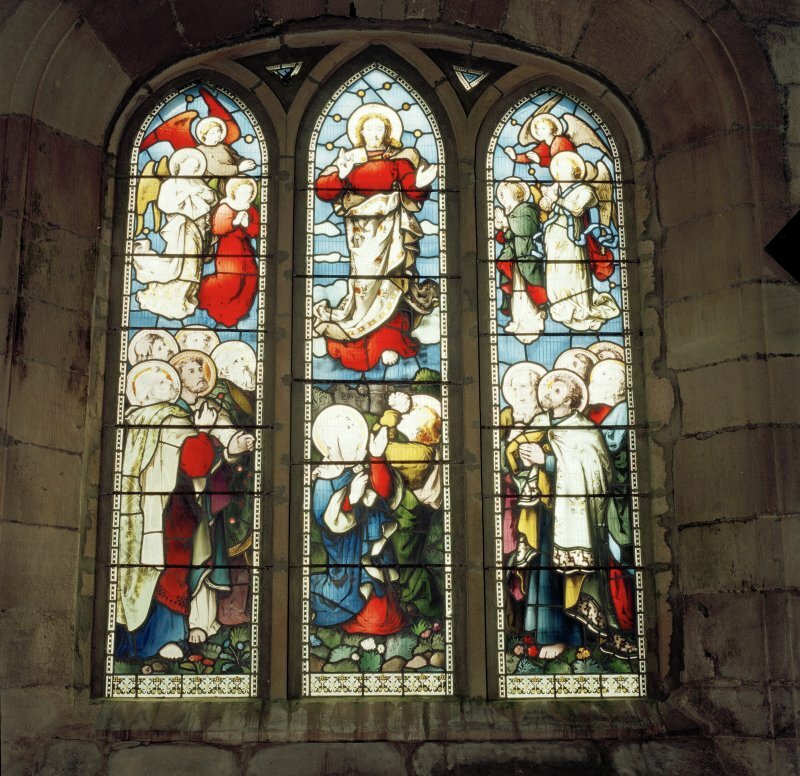 Some have linked the famous architect, William Adam, to this work. 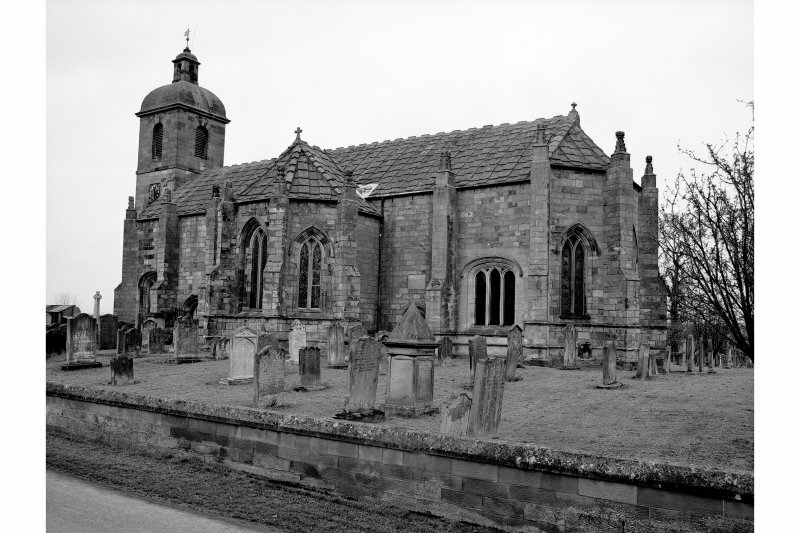 It is said that this church was ordered to be built by King James IV. 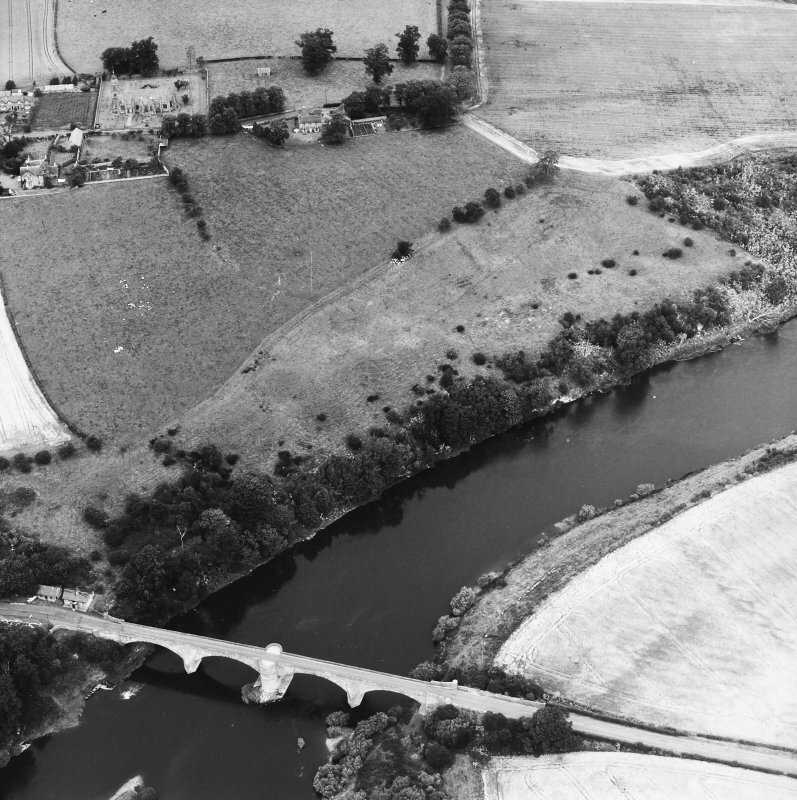 Tradition has it that James, on returning to Scotland following a successful military campaign in northern England in 1496, fell from his horse while fording a swollen River Tweed at Norham Bridge. He believed that he had been saved from drowning by the Virgin Mary, and celebrated his deliverance from death by founding a church which was dedicated to her. 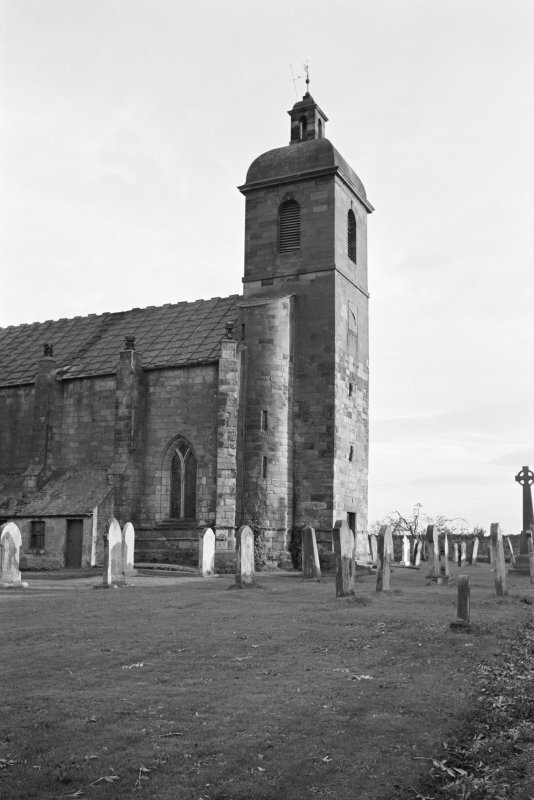 (NT 8887 4765) Ladykirk Parish Church. 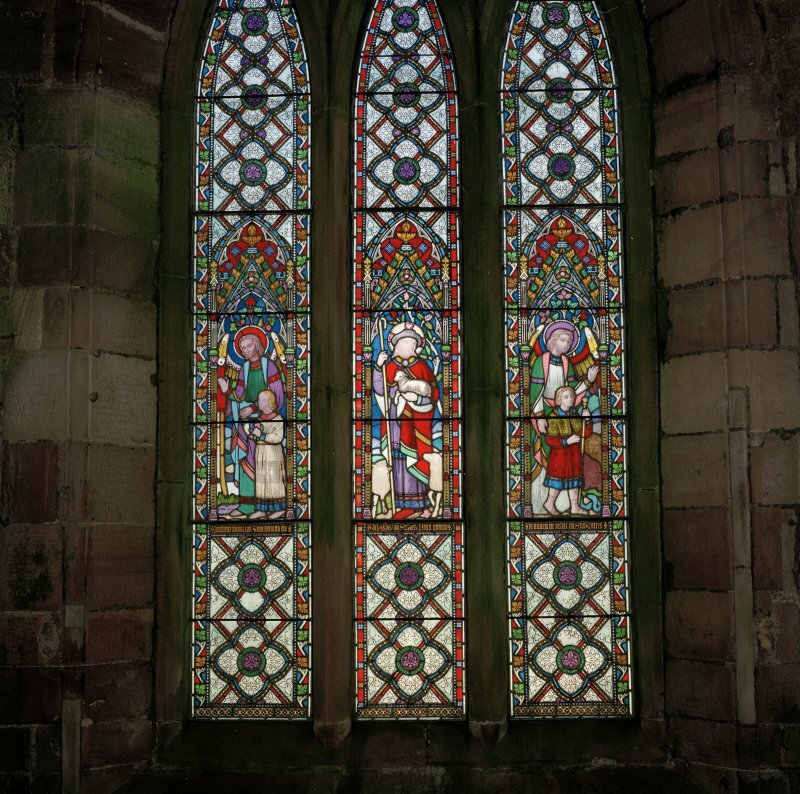 This is an exceptionally complete example showing the final development of the Gothic style in Scotland at the close of the 15th century. 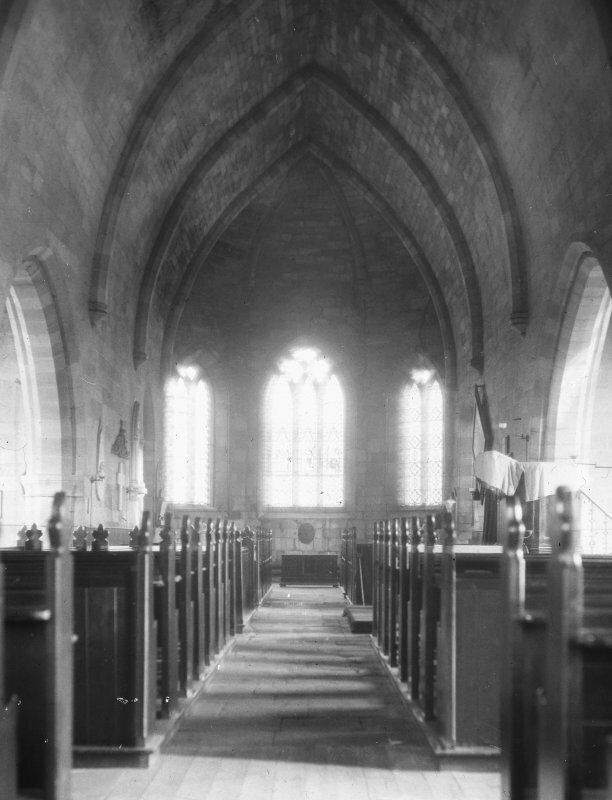 It is cruciform on plan (See RCAHMS 1915 plan, fig.92) without aisles, and has three-sided apsidal terminations to the choir and transepts, while the W end finishes with a square tower. 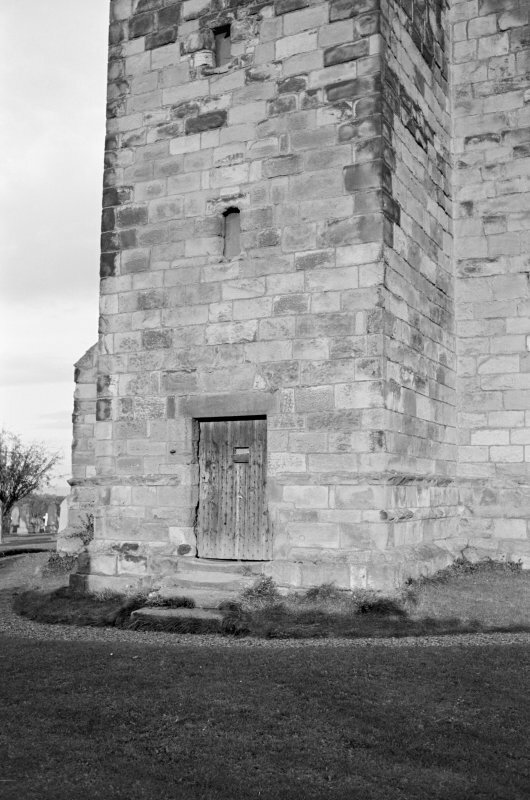 The older part of this tower is of three floors, each vaulted; it appears to have been constructed with a view to defence. 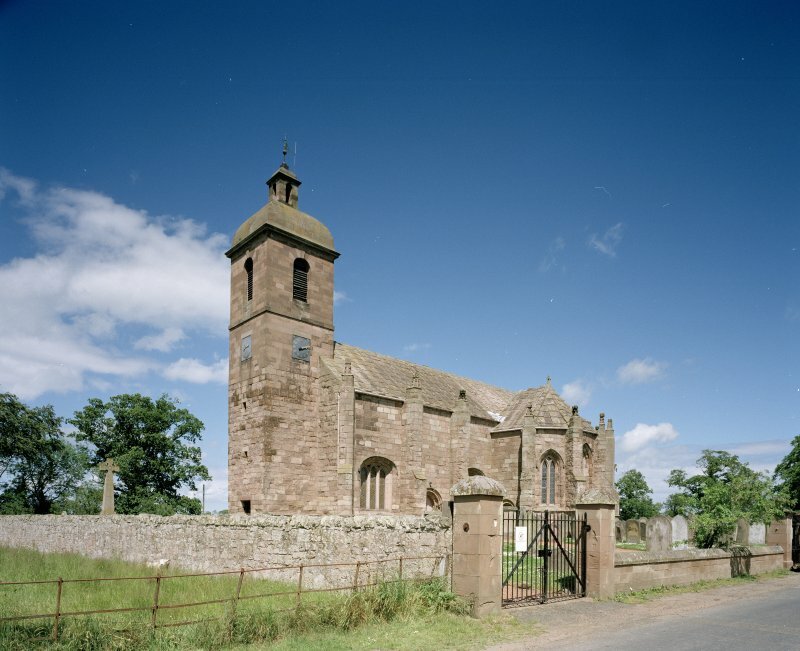 The church is said to have been built by James IV and dedicated to 'Our Lady'; it is usually identified with the 'Kirk of Steill' for the building of which sums are specified in the royal accounts from 1500 to 1513. 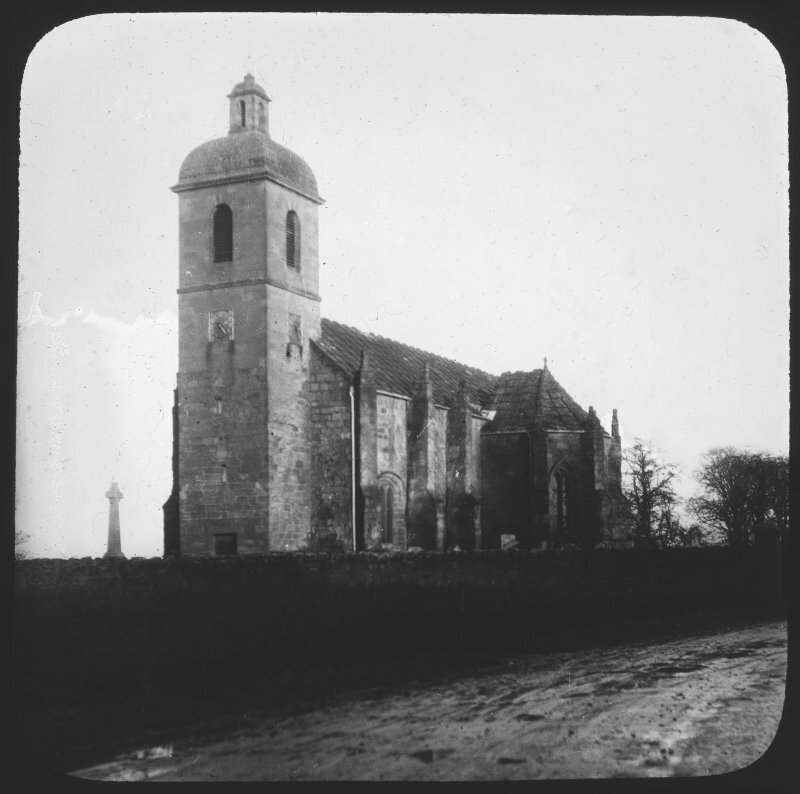 This church probably stands on or close to the site of its predecessor. 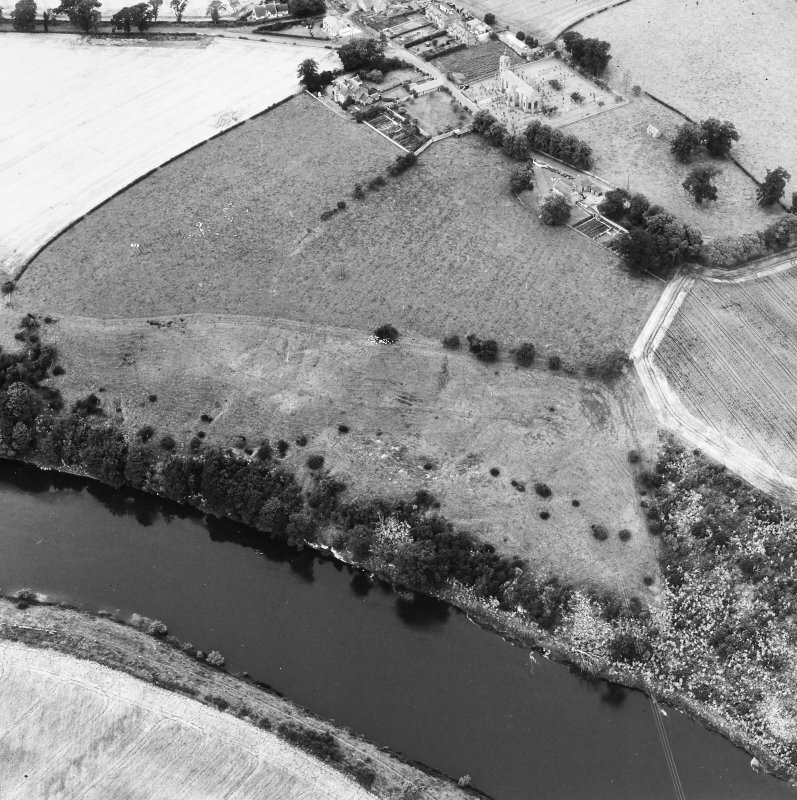 In 1885 two human skeletons were found partly beneath a buttress on the N side. 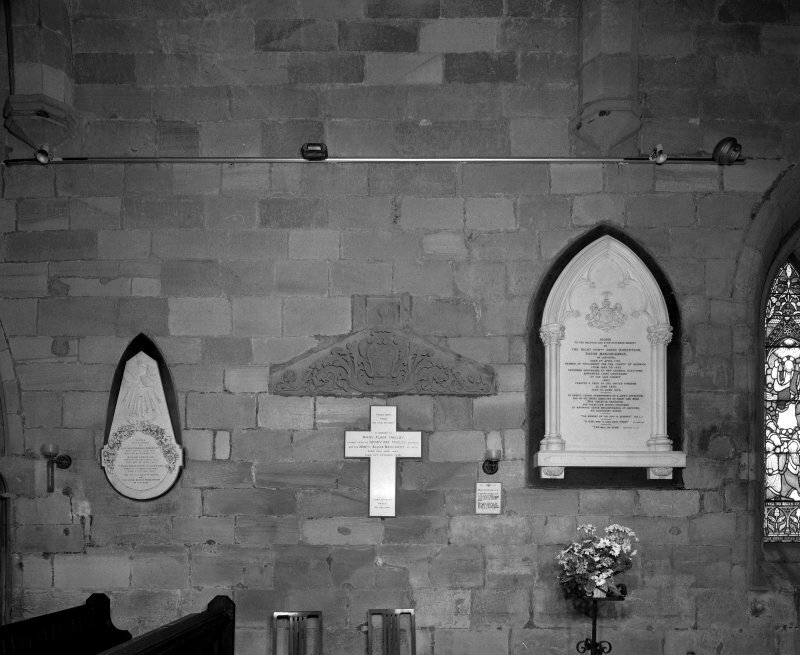 A number of other burials were also found beneath the church in the 19th century. 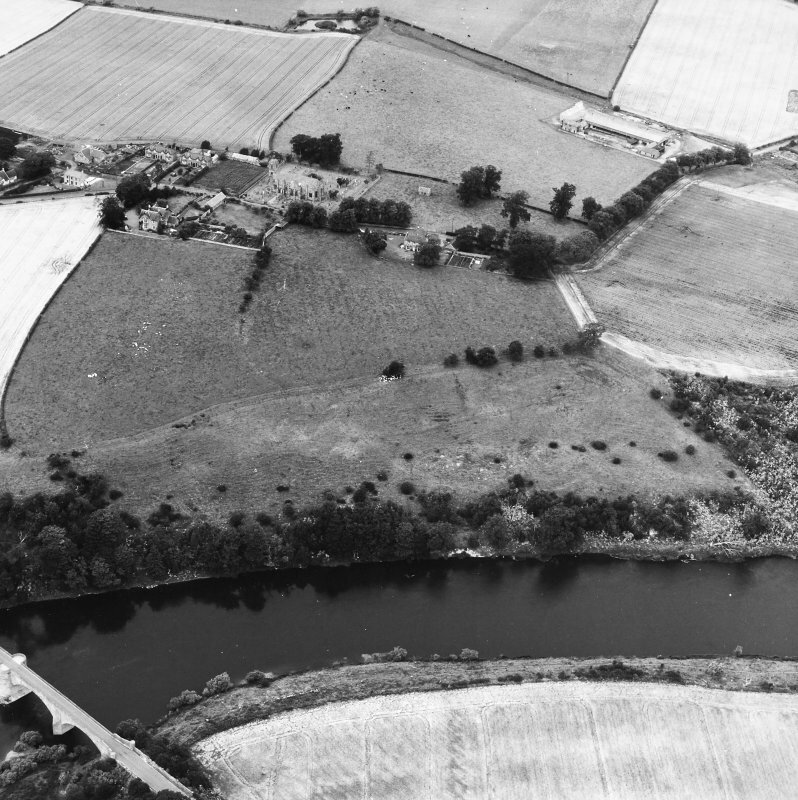 RCAHMS 1980, visited 1979; W Dobie 1882; 1887; J Ferguson 1892; J Robson 1896; D MacGibbon and T Ross 1897; I B Cowan 1967. 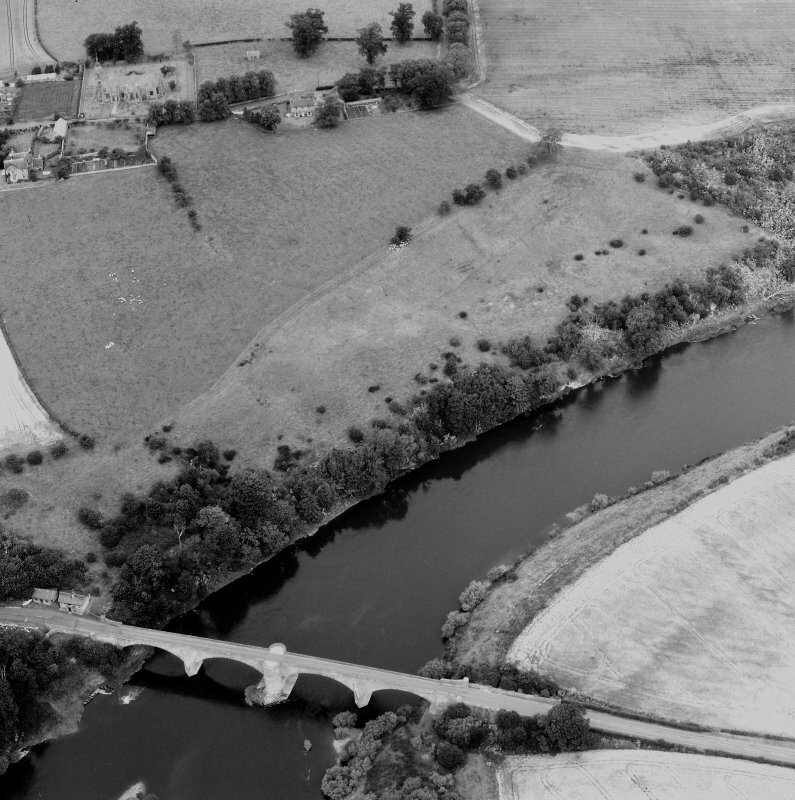 A nearby ford on the Tweed was in use until 1839 when superseded by a wooden bridge on stone piers. 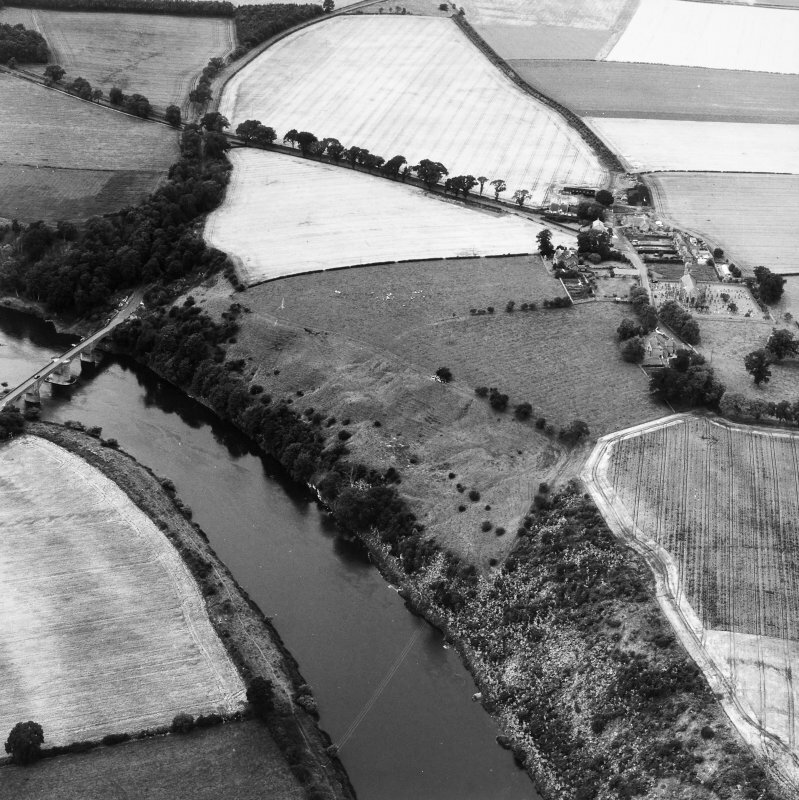 Many invading armies once crossed the river at this point and tradition says that the church was built by James IV and dedicated to the Virgin Mary in thanks for his deliverance from drowning whilst crossing in a sudden spate. 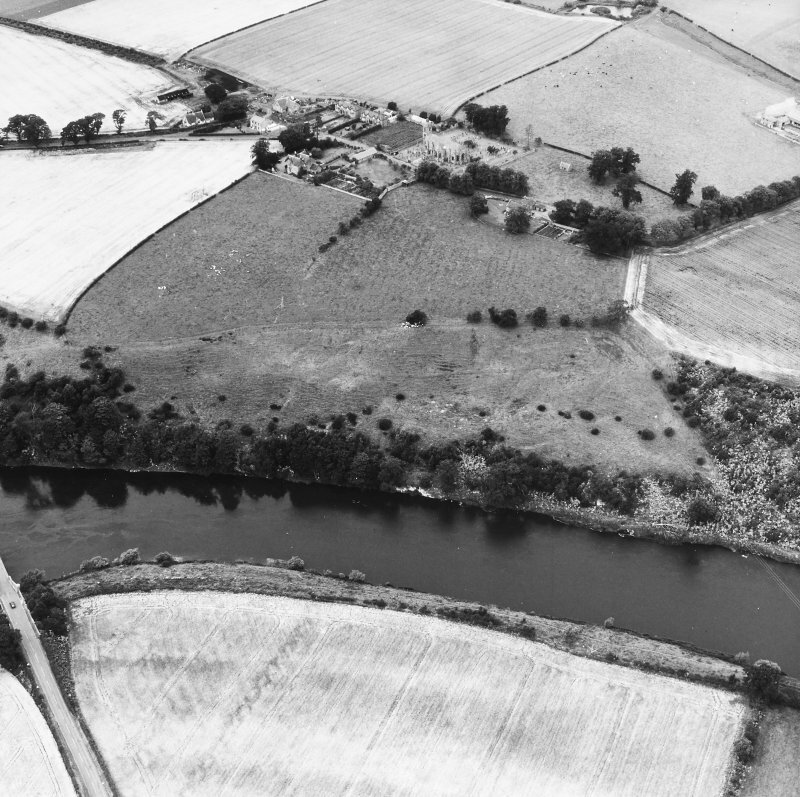 Ladykirk is generally identified as the "Kirk of Steill" (stell: a deep pool where salmon nets were set), as specified in royal accounts of 1500-1513. 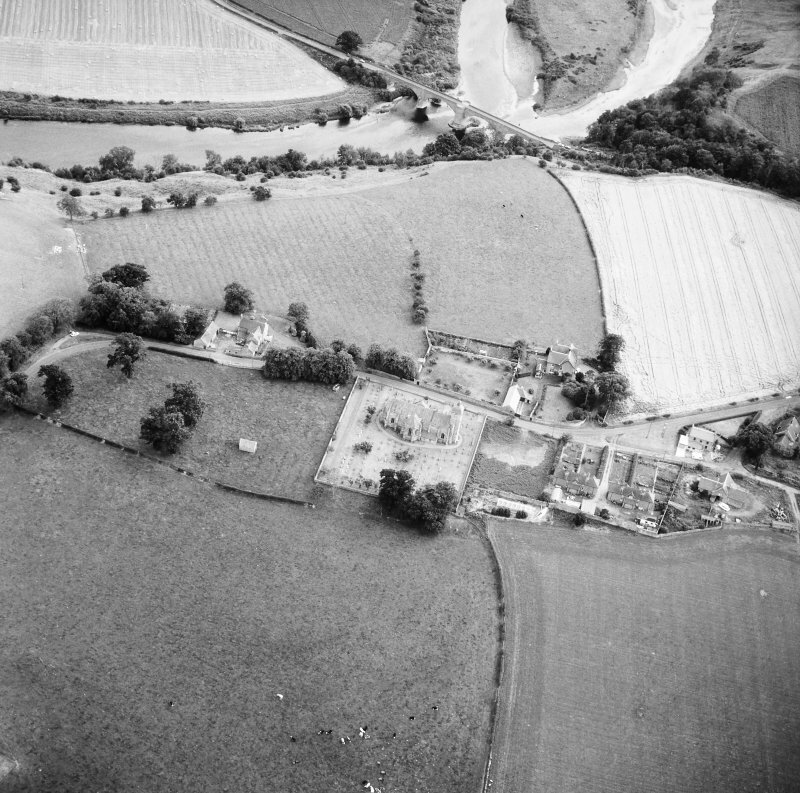 After the Reformation the church combined the ancient parishes ofUpsettlington and Horndean, both recorded in the 12th century. 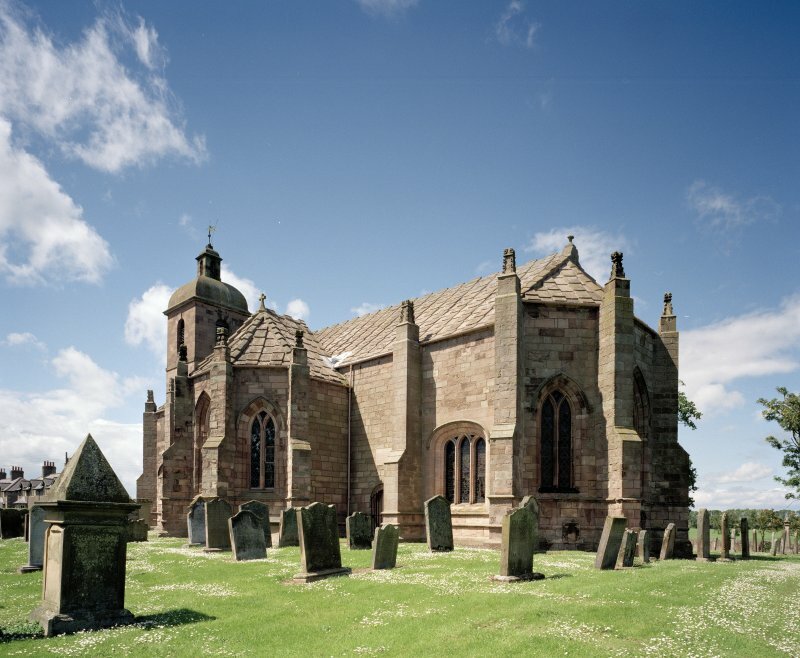 It is a remarkably complete example of the final development of the Gothic style in Scotland. 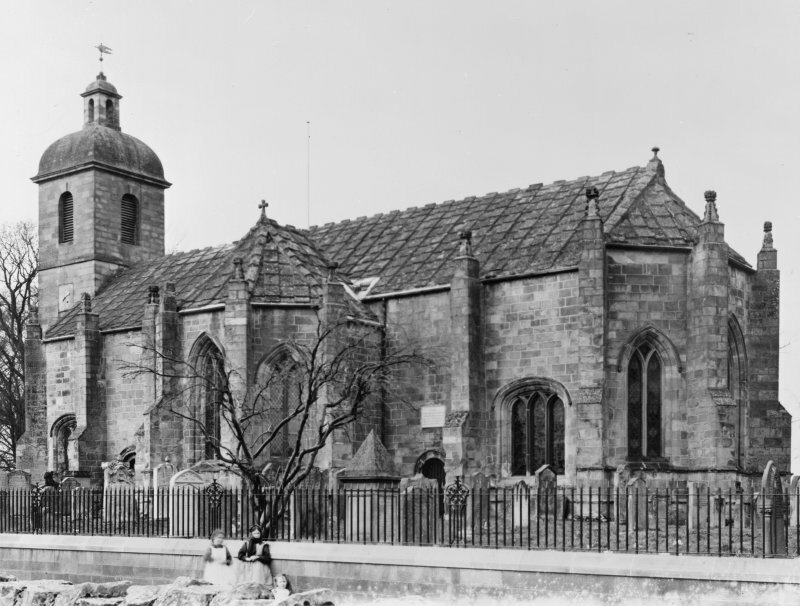 Greatly altered in the first half of the 19th century, when the west end was separated off and used as a school, in 1861 the division was removed and the church repaired and restored. 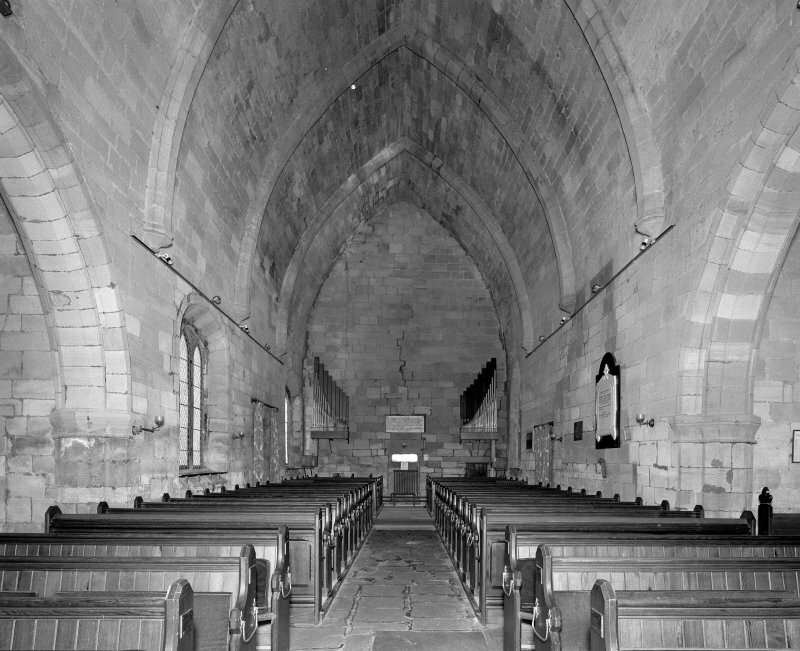 Cruciform but aisleless, the ends of the choir and transepts are rounded or apsidal. 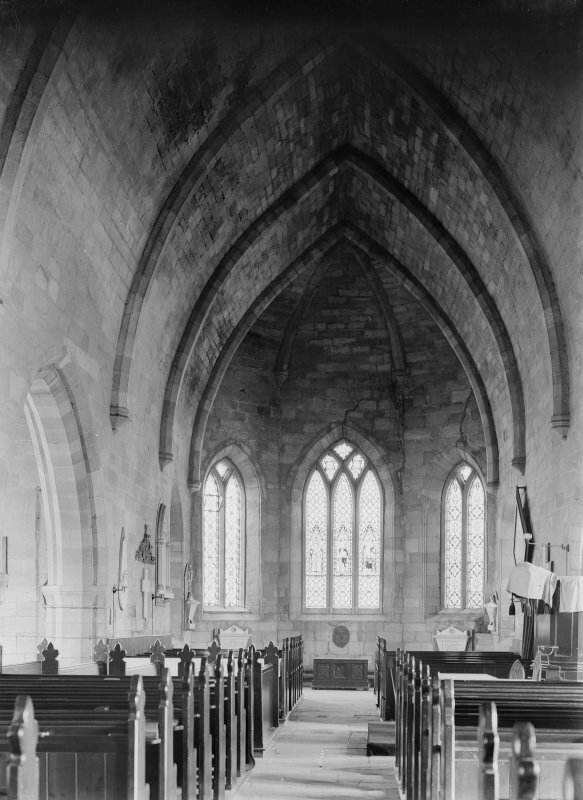 A further major feature is the pointed, stone-vaulted nave and chancel roof, strengthened by a series of splayed ribs resting on small, moulded corbels. This roof is responsible for the massive appearance of the exterior. 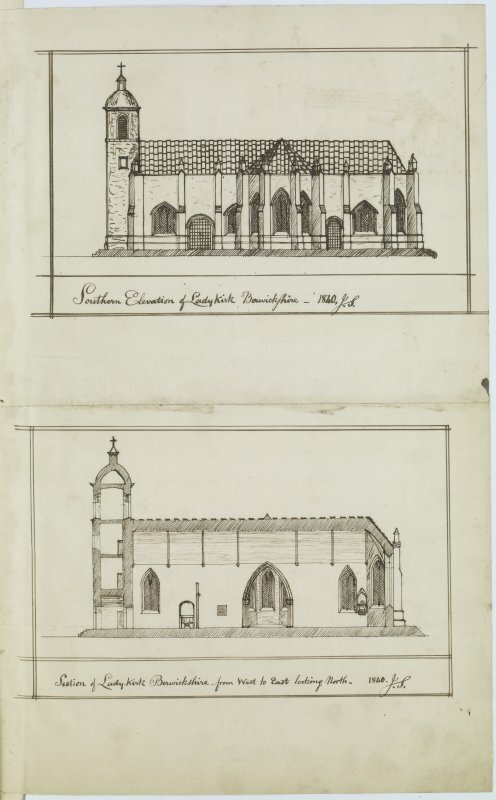 On the one hand, the huge external buttresses, matched to the ends of the ribs, were necessary supports for the heavy roof of overlapping stones. 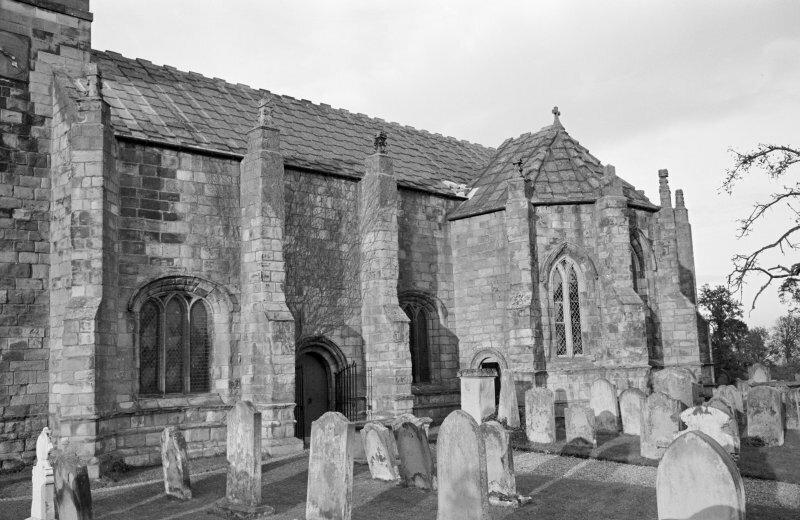 Equally, the line from which the main roof vault springs internally determined the upper limit of the window arches-hence the large expanse of plain external walling between the tops of the aisles and the wall-head. 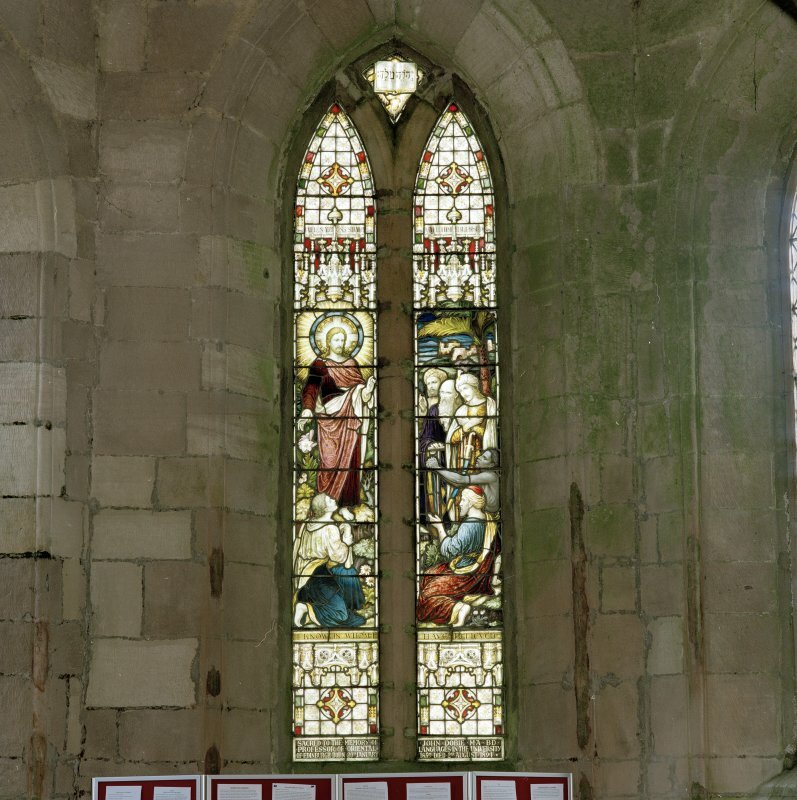 In the apses and north wall, the windows comprise two or three pointed lights in the traceried heads; on the south side, to make the openings as wide as possible, the arched heads are elliptical. 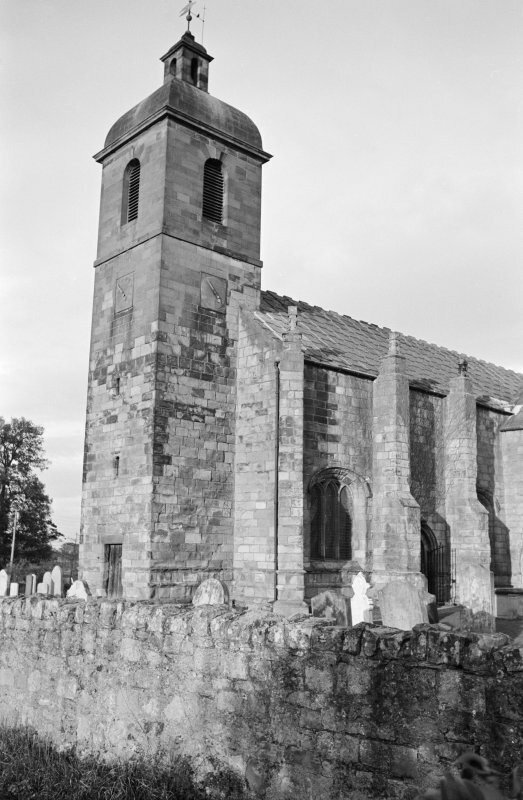 The upper part of the tower, said to be the work of the elder Adam, was added c1743. The lower three floors, however, similar to towers in Northern England, seem to have been designed for defence. 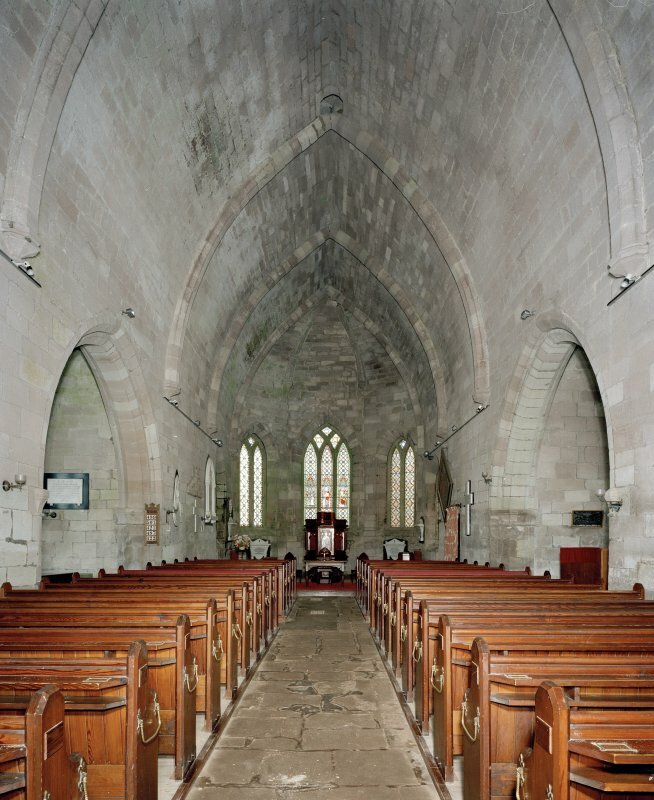 Some 2.5m square internally, with walls 1 m and more thick, there is no access at ground level from the church; by contrast the only access to the upper floors is by a turnpike stair from within the church. 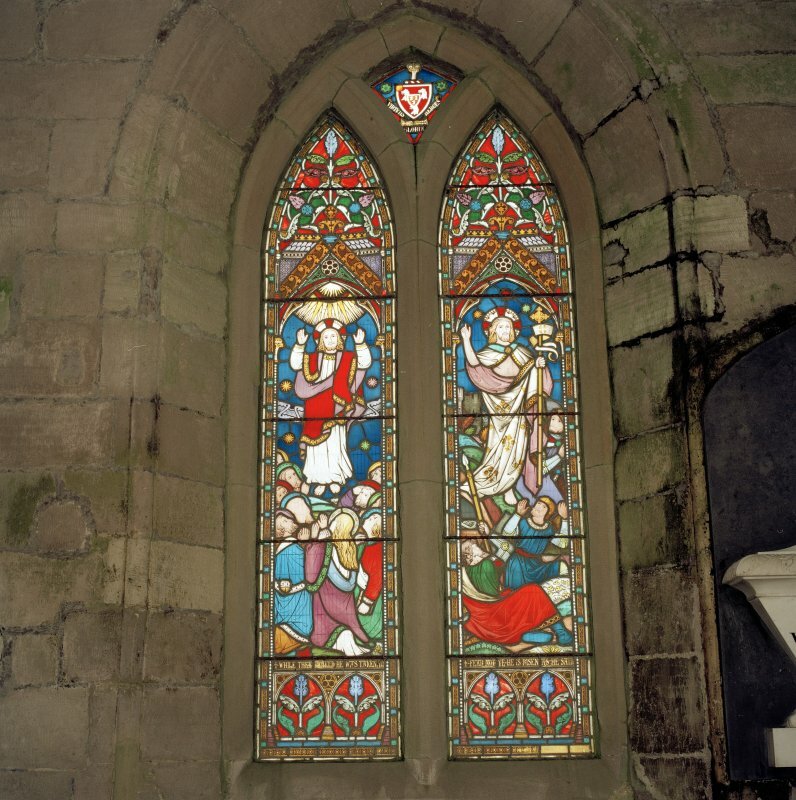 The upper floors provided the priest's quarters, and a small window at first-floor level, now blocked up, looked into the church. 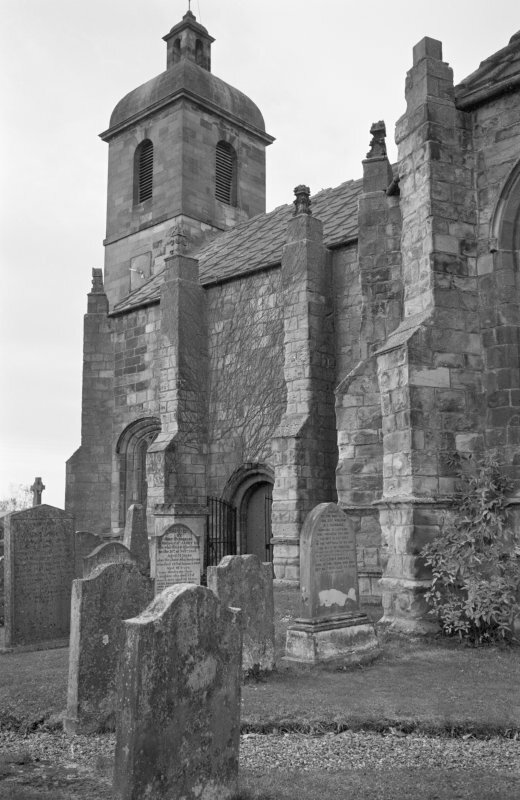 Each of the three floors had a strong, substantial door and a stone vaulted roof, later pierced to accommodate bell ropes. 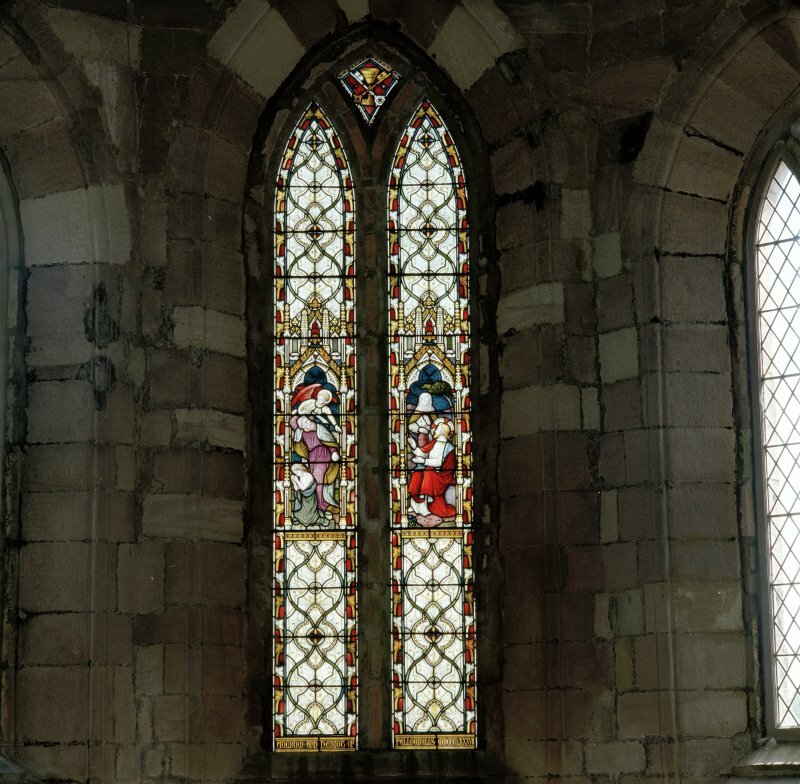 The lowest room has a good range of mason's markson the underside of the doorway arch, on the walls and on the vaulted roof It was later used as a prison (the jougs, an iron collar and chain, hang outside), and in this respect bears certain resemblances to the larger, later tower surviving at the west end of Greenlaw Kirk (NT 711461), built as a jail in 1712 and with the now vanished courthouse adjoining its west side.